The below text is out of date. Here is the current download link to the WordPress plugin, the advanced excerpt plugin. The plugin is still active, and many people are using (90K+), but the Plugin has not been updated for over 2 years. This plugin adds several improvements to WordPress’ default way of creating excerpts. In addition to keeping HTML markup in the excerpt, the plugin also corrects HTML that might have been broken due to the trimming process. Version 0.2.1 adds support for multibyte characters (eg. Chinese and Japanese). This is slightly experimental, more details in the FAQ. Plugin translations are fully supported and language files are included for translation. The FAQ provides more info on this, also. The default excerpt created by WordPress removes all HTML. If your theme uses the_excerpt() to view excerpts, they might look weird because of this (e.g. smilies are removed, lists are flattened, etc.) This plugin fixes that and also gives you more control over excerpts. I haven’t had the chance to test the plugin on many versions of WordPress. It has been tested on 2.2 through 2.7, but it might work on other versions, too. You can safely try it yourself, because the plugin is unlikely to break anything (it’s only an output filter). Please let me know if you succesfully tested it on another version of WordPress. Is this plugin available in my language? / How do I translate this plugin? The plugin comes bundled with a few languages. The correct language will automatically be selected to match your WordPress locale. More information on translation will be added in the future. Does this plugin support multibyte characters, such as Chinese? First of all, it should be noted that word-based excerpt length only works if your language uses normal whitespace as a word separator. If you use another language, you have to uncheck the Use words? option. PHP’s support for multibyte characters is not perfect. The plugin provides support for these characters to the best of its ability, but there are no guarantees that everything will work. Your best bet is to use UTF-8 encoding (which WordPress uses by default). If you still encounter problems, check with your host if the mbstring PHP extension is enabled on your server. Can I manually call the filter in my WP templates, for example? The plugin automatically hooks on the_excerpt() function and uses the parameters specified in the options panel. If you want to call the filter with different options, you can use the_advanced_excerpt() template tag provided by this plugin. This tag accepts query-string-style parameters (theme developers will be familiar with this notation). Does this plugin work outside the Loop? No, this plugin fetches the post from The Loop and there is currently no way to pass a post ID or anything custom of that kind to it. You can, however, consider to start The Loop manually. Russian roulette has been a buzzword for several decades when it comes to chance or taking chances. Russian roulette is played by leaving one bullet in the cylinder of a revolver, spinning it, and pointing the revolver to the head. Out of 5 empty cylinders and 1 bullet, there are 3.5 chances that the gun will discharge, without spinning the cylinder between pulls. If you spin it in between pulls, the probability goes up to 6. While Russian roulette can be life-threatening, roulette for high rollers is definitely safe and you may want extra cash. The game has claimed many lives, both young and old, famous or regular folks, all over the globe. Who would have thought or created this deadly game? The name and game Russian roulette can be attributed to writer Georges Surdez . The name Russian roulette first came out in his 1937 short story or the same title, which came out in Collier’s magazine . In his story, the game is called for a revolver with 5 chambers with a bullet and 1 empty chamber. Georges Arthur Surdez was a Swiss writer born in 1900. As a young boy growing up in Biel, Switzerland, he already loved reading books. He was into history, fairy tales, and action adventure stories. His helped him not to focus on his father’s wifeizing and drinking. His family migrated to the US in 1912 and the attended school in New York. As he didn’t know the language, he was bullied as a kid, dubbed as a weirdo. The further found solace in his books and deepened his interest in the Foreign Legion. Before he got into writing, he worked as a clerk and an independent clerk. Pulp stories picked up so, between 1921 to 1922, he used his free time to write short stories. By October 1922, his short stories finally got published by Adventure magazine. Argosy picked up and published what Adventure magazine dropped. It was not until the published short story, A Game In the Bush , was able to leave his job and write full time. The short story was spinned into a movie called South Sea Love in 1927. He married Edith McKenna in 1922, a school teacher. He got naturalized in 1928. After touring Africa and Asia, they were with the Great Depression in the US in 1930. Georges’ commissioned works diminished so he had to try something else to make ends. In 1933, Collier’s magazine published A Job in the Legion and other legion stories were commissioned. In 1937, Georges wrote a short story about French legionnaires in North Africa entitled Russian Roulette . The name has been used by Russians since the 1920s but it was the first time it was seen on print. When World War II happened, pulp stories and Legion stories were no longer selling like hot cakes. Georges had to scrape by. His wife left him in 1943 and they were later divorced. He persisted in his writing while not as prolific as before. He came out with an autobiography before he died in 1949. Even if you’re already taking all the necessary precautions to maintain and protect your WordPress site, sometimes your site can still go down for reasons that you can’t control. You need to be prepared for when this happens in order to quickly put things back in order because the longer you wait, the more money you’re leaving on the table. Fortunately, there are a few nice website monitoring services and tools out there that will monitor WordPress uptime and downtime for you, so you don’t have to check it manually. There are all kinds of reasons outside of your control that can cause your site to go down. When that happens, one of these tools can quickly notify you so that you can step in and get things working again. Orbit Fox is our own good-to-have-around-the-house plugin, which adds extra functionality to your website in minutes. The tool comes with free modules that you can activate independently based on your needs. The uptime monitoring is one toggle away after you install the plugin. 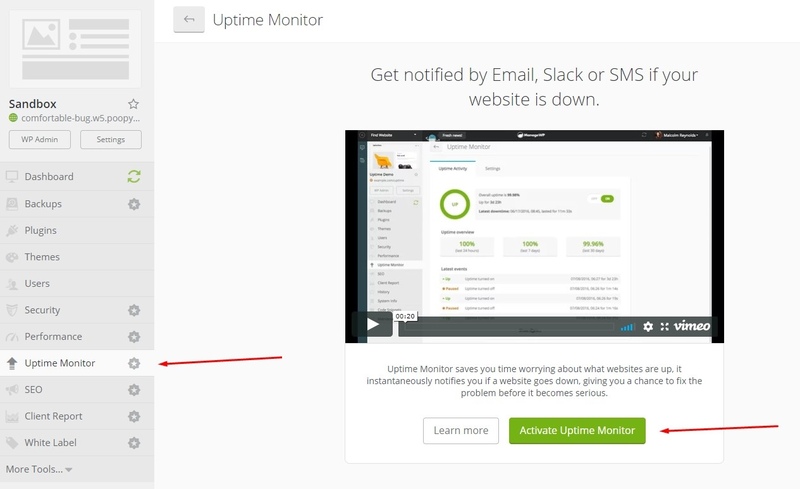 So, after you check Activate for Uptime Monitoring, a pop-up will ask you for your email address. From then on, Orbit Fox will send you an email if your site ever goes down. Apart from uptime monitoring, Orbit Fox provides multipurpose add-ons, such as social media icons, page builder widgets, templates, free stock photos etc. In short, this tool is offering a fast, free, and basic solution to monitor WordPress uptime. 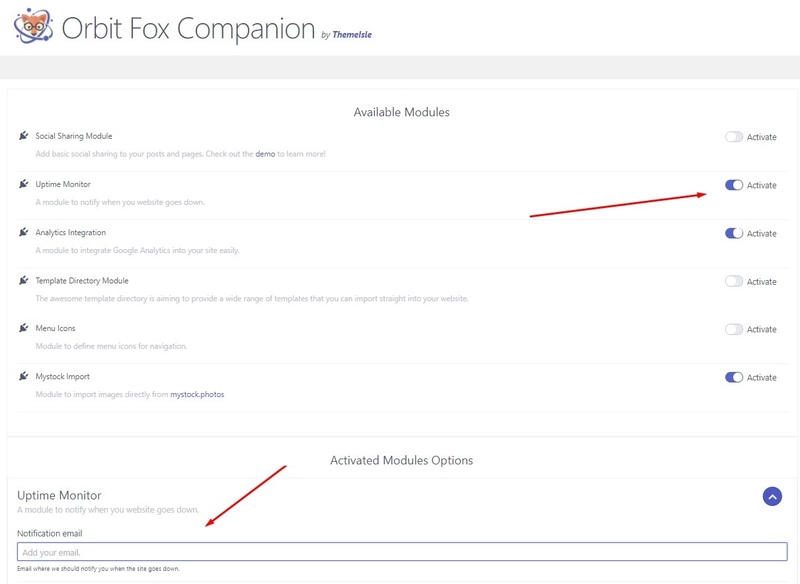 Another nice thing about Orbit Fox is that you don’t need an account to have it running; just activate the plugin and the module. 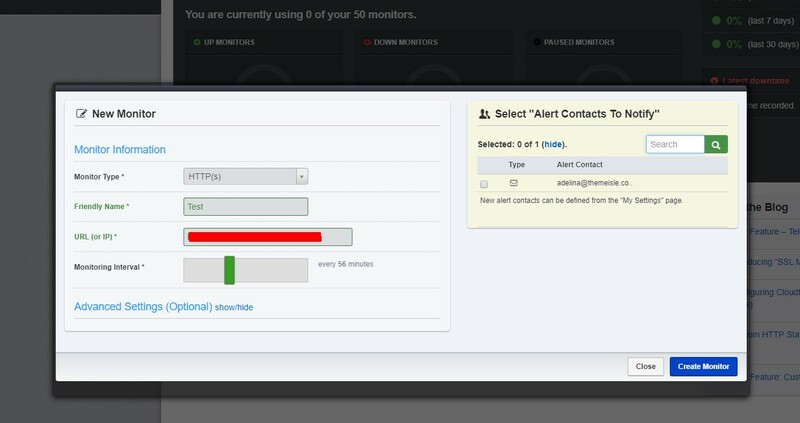 Uptime monitoring and email alerts. Elementor and Beaver Builder add-ons and widgets. Free stock photos integration from MyStock Photos. Orbit Fox is entirely free, with no premium features included. ManageWP Worker is the plugin that synchronizes the ManageWP platform with your site. The plugin provides some basic features for free, but the uptime monitoring feature is only available in the premium plan. 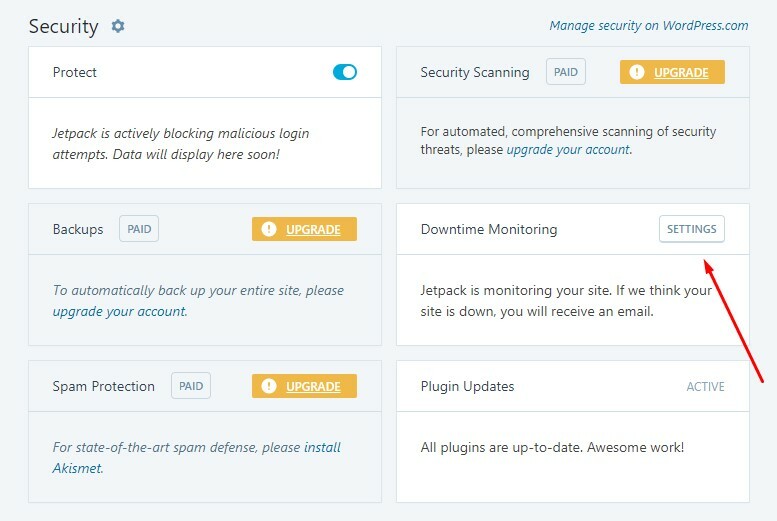 While you install it on your WordPress site, most of the action takes place in a separate dashboard provided by ManageWP, which monitors all of your sites in one place. So once you install the plugin, you need to go to your ManageWP account and add your site’s URL there. Modern dashboard with widgets for statistics. Security updates and checks in bulk actions. Automatic safe backups and updates. SEO ranking optimization (premium add-on). Cloning and migration (premium add-on). White label options (premium add-on). While the base tool is free, to monitor WordPress uptime you’ll need to pay $1 per month per site. Jetpack is quite similar to Orbit Fox. It is a multipurpose plugin that does a bit of everything, and helping you monitor WordPress uptime is one of those things. To use the plugin, you just need to activate it, connect it to your WordPress.com account, and enable your desired modules. In this case, you specifically want the Downtime Monitoring feature in the Security tab. Click on the settings at the top of the Downtime Monitoring box in the dashboard, select your preferences, and you’re good to go (aka the plugin will start monitoring your site and will send you an email if it goes down.). Keep in mind that Jetpack does not offer advanced monitoring, but only basic checks and notifications when your site goes offline. Also, you don’t have any advanced settings for customization. Lazy image loading for a faster website. Hundreds of professional themes for any kind of site. Unlimited and high-speed image and video content delivery network. Malware scanning and automated threat resolution. Secure logins and daily backups. Spam filtering and downtime monitoring. Downtime Monitoring is available on the free Jetpack plan. Uptime Robot is a free tool entirely devoted to uptime monitoring. It lets you add 50 monitors (aka websites, pages, or forms) that are checked every five minutes. To start the adventure, you need to create an account here – just like in the other cases. The cool thing is that it will allow you to monitor WordPress uptime without the need for a plugin. For more features and functionality, you can upgrade to their premium plan, where you can get a larger number of monitors that check more frequently. Multiple types of checks: HTTP(S), ping, port, and keywords. Alerts via email, SMS, Twitter, push notifications, Slack, HipChat, web-hooks. Statistics for uptime, downtime, and response times. Downtime verification from multiple locations. Public status pages for team sharing. Last but not least, InternetVista is a paid solution for businesses that need to put their sites under observation. Their motto is “Uptime is money”, which is definitely true for professionals. Even though the tool doesn’t provide free services, you can test it by signing up for their free trial period that lasts 31 days. Once you sign up, you can add your site and view its stats in a dedicated dashboard. In the Applications tab, you can set up your preferences regarding the alerts and what pages you would like to monitor. InternetVista lets you manage more than only websites: you can also add forms, landing pages, and other kinds of URLs that you want to get notified about. And in the Media tab, you can choose how you want to be alerted – by email, SMS, Twitter, Slack etc. Nothing to install or to develop; just an online registration. No false alarms. All the errors are checked twice before sending the alerts. Professional assistance is one telephone call away. Monitoring subscription management via multi-user web application, mobile apps, or REST API. Monitoring of all your web services: website, user path, API, email servers, online services, and various technical services. Real-time alerts (integration with WordPress, Slack, Twitter, or SMS). These are our recommendations to monitor WordPress uptime and downtime regularly, so you can make sure everything works smoothly on your site. But in case we did miss something important, we would like to hear it from you. You’d make us happy if you would share your own methods for monitoring your website via the comments section below.